Kenyan artisans carve these handy servers from wild olive wood. In some East African countries, it's traditional (and yes, polite) to eat with your hands. 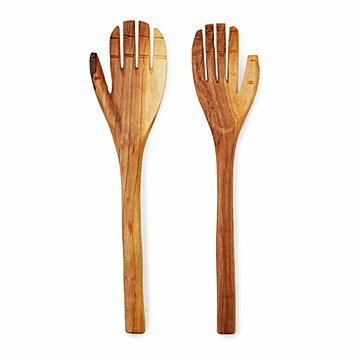 This same part of the continent is home to wild olive trees, so it may be no coincidence that these serving spoons are crafted in the shape of hands. Wildlife loves to forage the small olives and leaves from these trees, but a collective of Kenyan artisans makes expert use of the richly grained wood to hand carve their wares. Found mainly in wildlife preserves, African wild olive trees are subject to stringent forest management to ensure the health and longevity of the species. The wood carvers must register with a carving cooperative to obtain permits to fell trees. Their handiwork makes playful servers for salad and a great hostess gift. Handmade in Kenya. Hand wash with mild soap, water and dry. Occasionally, help condition and preserve your Hand Carved Olive Wood Serving Set with our Mineral Oil.